Scurr. I don’t understand why there has never been an official 2v2v2v2 tournament so I’m gonna host my own tournament with my lil tognament helpers. In 2v2v2v2 you play ffa mode 8 people = 4 teams of 2 people each. You play together with one other person, with a matching color (more about the color combinations in the schedule) to stay alive the longest. The team who has a player alive at the end of the ffa round, wins that round. You only gain points by winning the round. If one of the players wins the round, their team gets +1 point. If both players of a team survive till the end you get +2. Every team has to choose a counter. In game, the counter of each team is responsible of sending their current in-game score at the end of every single round. To do this, the counter has to send their teamname & teamscore, as seen in the example below. This gives every team an overview of current scores. All games will still be recorded, so the counting can not be manipulated (without punishment - more under Rules). At the moment we have 20€ in the prize pool of which 10 are from me and 10 from an anoymous donator, which will be split for the team. Either on Paypal or as CF2 premium/coins. More donations are welcome. Trying to cheat or sabotage the tournament will be punished. Depending on the severity of the offence it will be punished with a warning, points deduction or disqualification. I will be recording all matches and rooms at all times myself. If any forbidden acts get reported to me I will check the recording. Also this will be helpful for situations when points aren’t counted correctly (on purpose or not). 16 teams aka 32 players will play all 5 main rounds, without elimination or K.O. Within 5 rounds each team will play against every other. Every match you can gain 3 points as the 1st team, 2p as the 2nd team and 1p as the 3rd team and none as the last team. If two or more teams have tied in-game points their added up ffa score will decide who will get the point. More details about the schedule and how to progress to the final as soon as I'm done with the schedule. 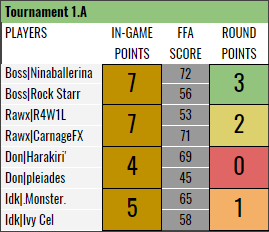 The winning team has to post their match link and the end result of all teams into #tournament-results of the CF discord server. I will still double check all results with the recordings. Both team members has to sign up. Your account needs more than 500 plays. But premium isn't necessary. Planned is maximum 16 teams. So there aren't many spots left! Team names have to be max 4 characters, since all players need to have it as their clantag during the tour. It will help other players see who play together. 3. Idk - Ivy Cel & .Monster. 10. zzxz - Try. & BREATHE. If you have any questions just hit me up or Celine aka Ivy Cel she will help me out. Also If you would like to play but don't have any mate yet, just comment below to find other lonely speeders. After the main 5 rounds the top 4 teams proceed to the final, but if for example two or more teams are tied on place 4, those teams will play that round 6 to determine who gets to the final. If there are 3 teams tied 2v2v2 will be played if its just two teams 2v2 in team mode will be played! And if there are no teams tied (which is unlikely) the 6th round will be skipped. If you signed up and your team mate doesn't seem to show up, find someone who is able to play instead for your mate but I have to approve that change. But once the round 1 starts all teams are set and done. And if a whole team is missing at tourney start I will try to find a replacement team. I know there is a lot which can go wrong in this tournament but it we will be fine. If you have any questions you can always @R4W1L in #tournament. I have no team mate, anyone want to play with a pancake? Anyone want to be with me? Our team's name is cfXD. I'm in with quentin tarantino. Im in with Quentin Tarantino. Alright, so I added all valid sign ups to the the main post. If you can't see urself there even tho you signed up, you probably did something wrong. There are still 3 places free!! Here the link to the schedule. If you are confused about the Anti-Tie Round check the end of the main post to which I added a explanation and one part about missing team mates. The round start times aren't set yet nor did I add all teams from this main post into the schedule but this will happen in the next few hours. Sorry, I signed on the wrong account. Please exchange Soulbind for me. Good that you found your mistake. Is reading really that difficult? I'm exchanging Quentin Tarantino. for Baby Shark. We have worked the situation out that Baby Shark and Quentin Tarantino. will swap. We have worked the situation out that Baby Shark and Quentin Tarantino will swap. so are Quentin Tarantino. & Sig Sauerkraut together?